Synopsis: A teenager facing an unplanned pregnancy seeks help from her acerbic grandmother, a woman who is long estranged from her daughter. Review: Were it not such a competitive year in the Best Actress Oscar race, Lily Tomlin may have become the 13th EGOT. Winning the grand slam of show business means that you’ve received an Emmy, Grammy, Tony, and Oscar and Tomlin is but an EGT at the present time. 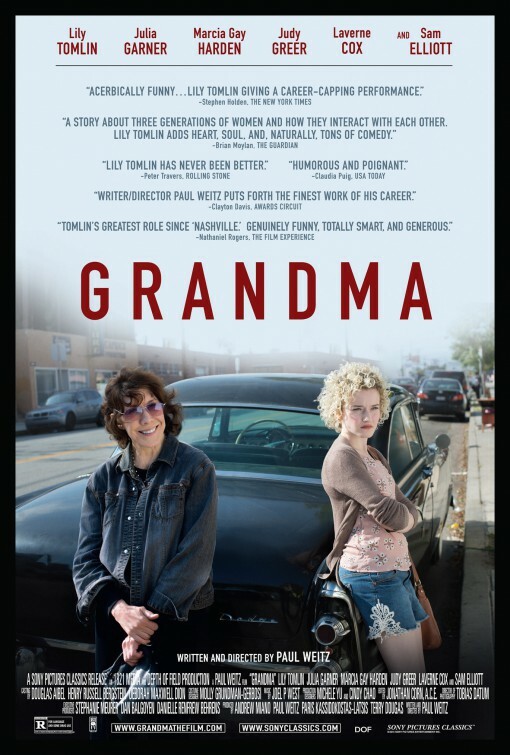 Though her performance in Grandma gives the comic actress the kind of star turn chance to shine that comes along rarely for actors/actresses of any age, I fear that it will be overshadowed by performances with more commercial appeal. Not to say that there isn’t a place for this dark comedy or Tomlin’s performance in end of the year accolades but at a scant 79 minutes the film feels like an extended short film rather than a fully produced three act structured piece. Writer/director Paul Weitz (Being Flynn) breaks the film into six chapters, seemingly editing around potential commercial breaks as we follow one eventful day for an acerbic septuagenarian and her teenage granddaughter. A folksy poet still not over the death of her long-time lover a year prior, the film opens on Elle (Tomlin, Admission, another Weitz film) breaking up with her much younger onetime fan-now-girlfriend (Judy Greer, Jurassic World and every other movie in 2015) in a most hurtful way. She’s barely showered post-breakup when her 18-year-old granddaughter Sage (Julia Garner, The Perks of Being a Wallflower) shows up needing money to pay for an abortion. Without the available funds to help (she’s long since decided to live off the grid, cutting up her credits cards), she instead offers to track down the money by any means necessary. That leaves the film open to explore many routes to the same destination. The careless baby daddy (Nat Woff, Paper Towns) is solicited for money and given a harsh lesson in respecting your elders at the same time while former friends (the late Elisabeth Peña and the overrated Laverne Cox) of Elle’s are asked to make good on debts. Finally, a trip to see a mysterious man (Sam Elliott, I’ll See You in My Dreams) from Elle’s past leads to the film’s most emotionally charged sequence. By the time we get to meet Sage’s mom and Elle’s estranged daughter (a tightly wound Marcia Gay Harden, Fifty Shades of Grey) we’ve come along on a darkly humorous journey filled with a fair share of emotional truths. Wearing her own clothes, driving her own car, and playing a (I think) less emotionally stagnant version of herself, Tomlin breezes through the movie with a tough charm and fragile core that belies her hardened exterior. While her scenes with Greer lack a certain kind of chemistry, the sparks fly in her interactions with Elliott. Elliott remains one of our great underrated actors and he’s damn good here as a man burned by Elle in the past for reasons I won’t divulge. Garner is appropriately defiant as the teenager who knows she can’t care for a baby and Harden takes a character introduced as a sweaty harpy and manages to caress it into something deeper. Running shorter than a visit with your own grandparents, the movie actually feels longer than it is. That’s not always a bad thing but there are some unexpected dips in momentum that stymie what could have been a film with a bit more pep. Still, any chance for Tomlin to get some time as a long overdue leading lady (her first leading role in 27 years!) is fine by me. She may not make it to full EGOT status, but after great success with her Netflix show and now this, her 2015 was filled with numerous wins. Synopsis: Self-described misanthrope Elle Reid has her protective bubble burst when her 18-year-old granddaughter, Sage, shows up needing help. Thoughts: It’s been a good year for Lily Tomlin. She recently scored another Emmy nomination for her work in the Netflix series Grace and Frankie and while I felt that the Netflix show had some serious problems, Tomlin’s aging hippie helped to make the series more palatable. Even better news is that advanced buzz on her performance in Grandma has been great…though it does creep me out that some critics have called it a “career-capping performance”…yeesh…she’s not dead yet people! Directed by Paul Weitz (Admission, Being Flynn) and co-starring Julia Garner (The Perks of Being a Wallflower), Judy Greer (Jurassic World), Sam Elliott (I’ll See You in My Dreams) and Marcia Gay Harden (Fifty Shades of Grey) this road-trip dramedy could find Tomlin attending the Oscars in addition to the Emmys.